I can use drawing tools to create. I can use graphical organizers to learn. I can use a variety of digital tools to learn. 1. Watch the Tutorial on Story Jumper together. 2. Pause at 0:56 to practice text box, font, size, color. ​3. Pause at 2:06 to practice props and grouping parts. 4. Photos can be searched without subscription, but not inserted into project. ​5. Pause at 3:30 to practice scenes and change order of pages. ​6. Pause at 4:22 to practice the front cover. 7. Finish the rest of the video. Course 1 is designed for early readers. Start with Course 1 for early readers. Students will create computer programs that will help them learn to collaborate with others, develop problem-solving skills, and persist through difficult tasks. Recommended for grades K-1. 1. 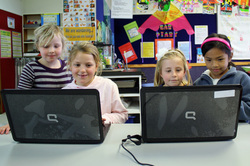 Stage 3 Jigsaw, Skip to Puzzle 5 & Demo and let students do at their computer. 2. Demo puzzle 6, do it wrong, reset, trash. Students do puzzles 6 & 7. 3. Demo how to break pieces apart on puzzle 8. Students work through puzzle 12. Stage 4 Maze: Sequence. Watch the intro video together, demo puzzle 1, students do first 5 puzzles. Demo puzzle 6. Let students do thru puzzle 13. Demo puzzle 14. Students are finished after puzzle 15. 1. Click on icon left, then on bottom left choose to get access code. 3. Drop down How Old are you menu and choose 4-8 years old. 12. Around level 8 or 9, some students need help. Call all students back. Sort students based on those who have completed level 9. Those that need help can choose from the "experts" and take them back to their computer. Experts can advise but not click.